G4K Cute Koala Rescue 2 is another point and click escape game developed by Games 4 King. There was a beautiful wooden house in the center of a beautiful and magnificent forest that was beautiful to look at. The place is very natural to see. The wild beast of the Cute koala lives in that forest. People in the area are holding the animal and being held in the house. It is your duty to save the cute koala beast from there. It will help you to find the hidden clues in order to save that animal. 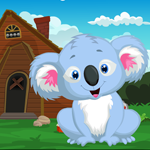 Find the clues and save the cute koala animal and congratulate you in the game. Good luck and have a fun!